I am not sure if it is considered cheating or not, but because the majority of my quilts are kids size, the task of finishing them is not as daunting/labor intensive as an adult size quilt. I must admit I do like the fact I can try an idea or color scheme out with out too much commitment. 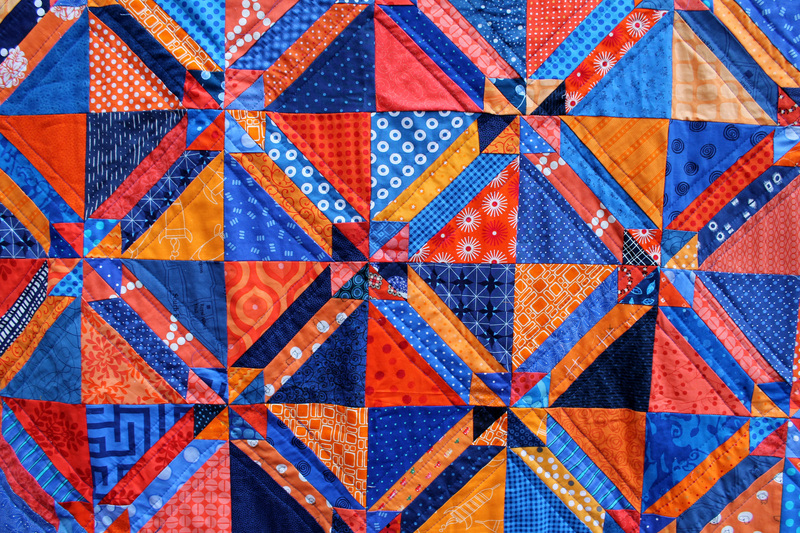 With the gretchen quilt I wanted to try two things I had not done before – the pattern, which is a very traditional quilt pattern and the orange/blue color scheme. Here is the results…. 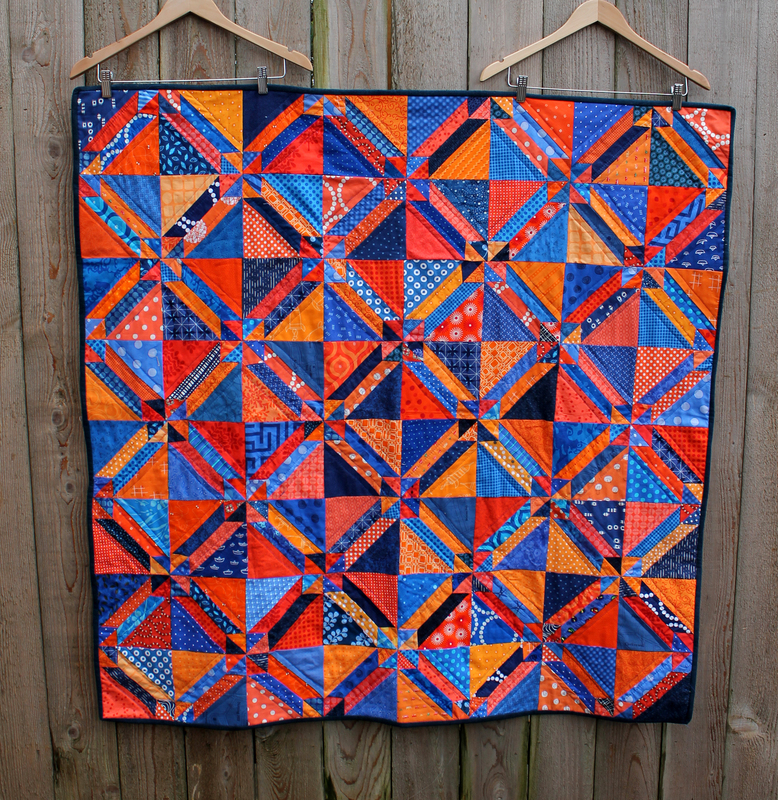 I must admit I am really pleased with how this quilt turned out. The colours pop and the pattern looks complex but is really quite easy. I blogged about this quilt block a couple of weeks ago, and included a couple of links to the pattern. You can click here to find it if you are interested. I went the paper piecing route and the only annoying thing was using the tweezers to remove the bits of paper wedged where eight corners meet. I did learn a valuable lesson with this – if possible remove as much of the paper corners before you sew the blocks together. I really does minimize the tweezer work and save time in the end. I did simple straight line quilting, following the lines of the block and then stitched around the center of the square. I am still traumatized by the stipple quilting I did recently and think straight lines are still the go for the next couple of quilts. 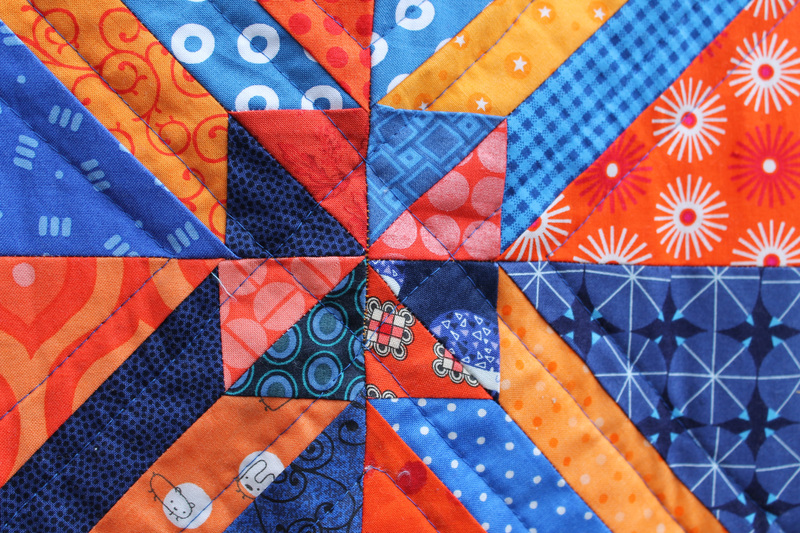 In my quilting defence (i) there is no stitching in the ditch and (2) I think the quilting compliments the piecing. 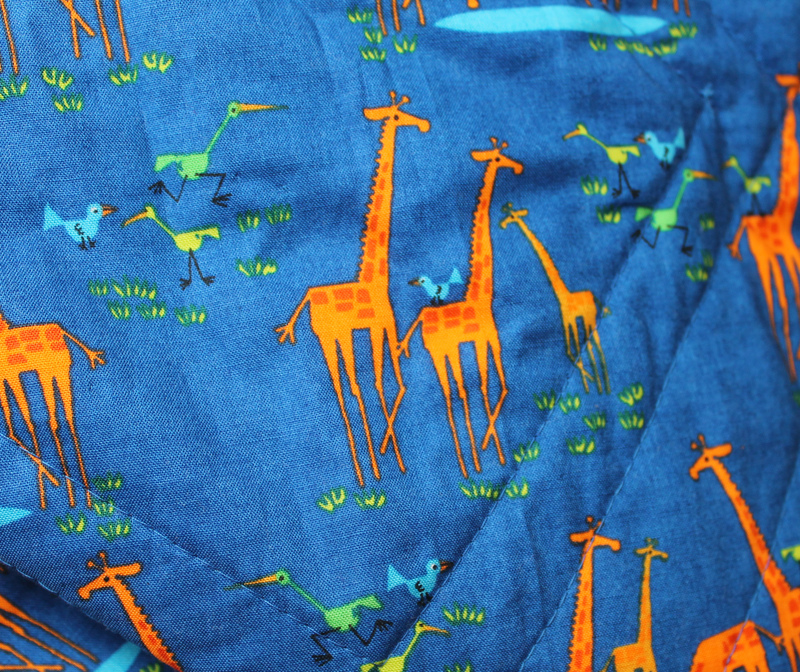 When it came time to put the back together I found in my stash the most perfect backing fabric….Ed Emberley’s Giraffes from his Happy Drawing collection. I love this print and will have to track down some more, as I used it all on the backing. The design is fabulous and very boy appropriate. For the binding I choose a solid navy/denim cotton which seemed to work really well. I hand stitch all my binding and the little bit of stretch in the fabric made it easy to work with. Now I am heading back to my pink & yellow quilt. After posting my work in progress this week, my niece has claimed the quilt as hers, so I am trying to get it finished fast. Thanks for the kind words. I must admit I can’t believe I did not do these colours sooner. Thanks. 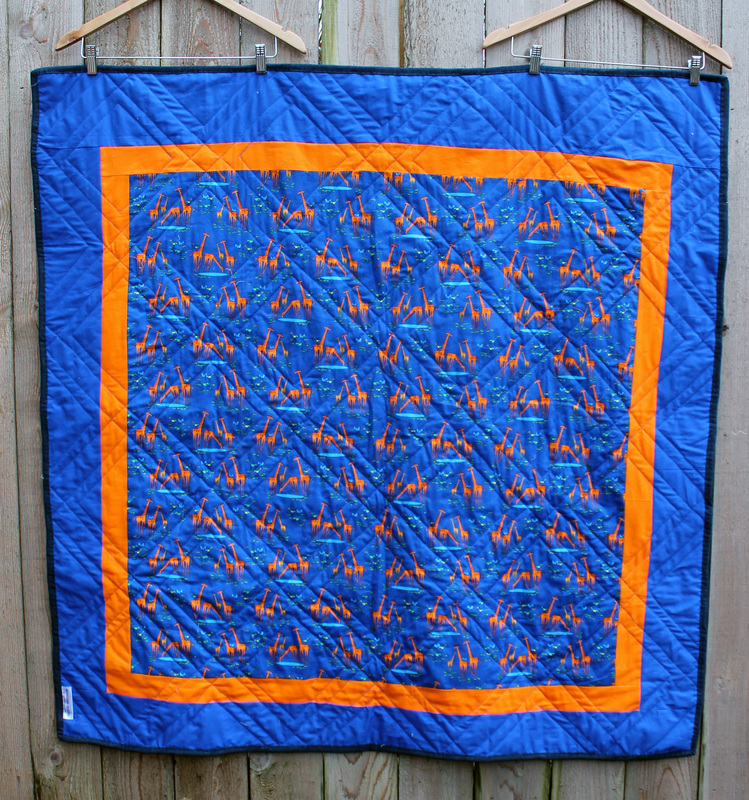 I am really ridiculously pleased with how this quilt worked out. The back as well as the front are especially wonderful! Not a problem at all. It is one if my favorites. The quilt will eventually end up at Project Linus doing good too. 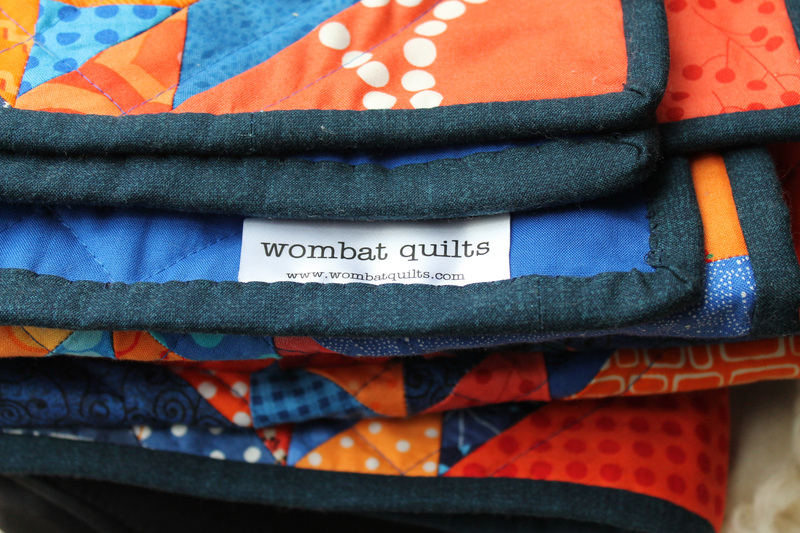 I forgot to add – I would love to see the finished quilt when done. Thanks.